Amanda Zurita: freelance writer, editor, world traveler and long time supporter of the Gossip & Glamour Style Summit. If Amanda looks familiar, it's because she's actually a Style Summit veteran. She was our first-ever Keynote speaker back in 2016 when we launched the summit, and, like a boss, delivered a beautiful keynote before embarking on a 12-month global travel adventure a.k.a. "remote year". 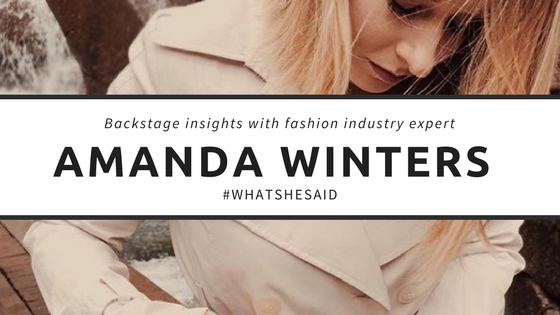 This time around, Amanda joined the "Fashion Essentials" panel at the style summit sharing tips on content creation and the lost art of writing. In her Facebook LIVE interview with Darcy Camden, Amanda talks about everything from her insane travel schedule (she's gone each spring/fall in Spain and Italy doing tours and guidebook research for Rick Steves) and talks about her latest passion project, UGH Life, a digital media platform for women. UGH loosely stands for Ultimate Girls Handbook and is a place for women to tell their stories and bond over shared experiences. Watch Amanda's full Facebook LIVE interview. Blue Nile fashion PR pro Amanda Winters took the stage at the Gossip & Glamour Style Summit on March 11th at W Bellevue like a boss. As part of the "Fashion Essentials" panel, Amanda shared her best tips on how bloggers can work with publicists to create meaningful brand collaborations. Her insight is spot-on because Amanda is also a lifestyle blogger and understands how integral solid relationships with publicists can be. Amanda is a wealth of knowledge for influencers looking to work with brands and be savvy with their content— plan your content 6-8 weeks in advance, reach out to brands with a plan on how you can tell their product’s story in your everyday life, and know that a “no” from a brand isn’t a forever no, persistence is key. Circle back when you have a different angle, and most importantly, work on building the relationship so that you can better understand the needs of the brand. Follow along with Amanda on her personal Instagram, @CallmeWinters. You can also view Amanda's full Facebook LIVE video with Darcy Camden of Styled Seattle. We were thrilled to have Amy Sarabi, Zumiez Private Label Design Director, participate in the "Future of Fashion" panel at the WHAT SHE SAID Style Summit. The former Project Runway Designer shared what it was like to experience the ups and downs of fashion today, and what it's like to receive feedback on her work from Tim Gunn. The bigger question, would she do it again? 1000% yes. In her Facebook LIVE interview with Darcy Camden of Styled Seattle, Amy talks about upcoming trends - 90’s are out, early 2000’s are in -, gender fluidity becoming more apparent in retail, and how people will shop differently in the future. Get educated by one of the best trendsetters we know and watch her full interview on the Gossip & Glamour Facebook Fan Page. Style Blogger + Designer, Elisa Yip, has been designing for over 20 years and she's all about the WHAT SHE SAID Style Summit because, for a long time, she didn’t even know fashion even existed outside of work. The summit helped her realize there are so many amazing, fashion-oriented people right in her own backyard. Her interview gets real when she talks about the truths of blogging and how isolating it can be. Needless to say, she's happy to discover that there's a huge blogging community here in Seattle, you just have to reach out to the right people! Connecting with people in the same industry has helped her to become a better blogger and ultimately a better designer because both online and offline conversations impact her designs. 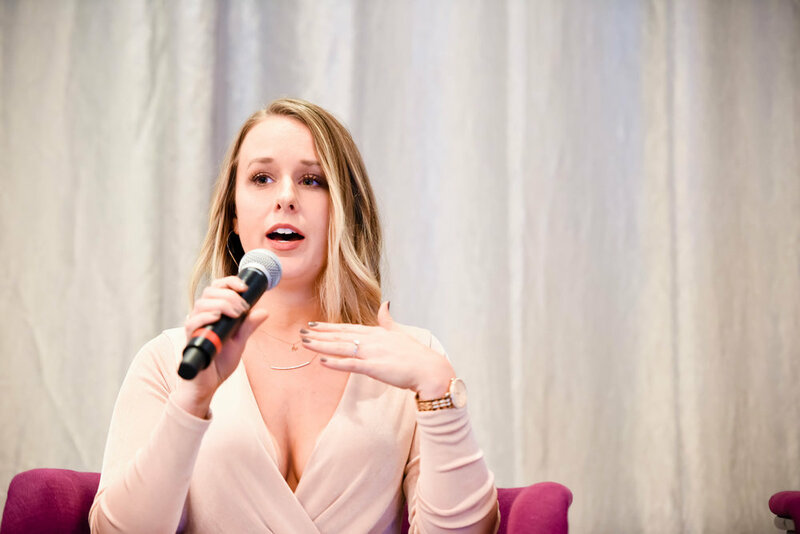 Brittany Hicks, founder of GIFT and buyer at Amazon Fashion, had amazing insight to share on the "Future of Fashion" panel at the Gossip & Glamour Style Summit. In college, Brittany studied Supply Chain management and didn't originally intend on working in the fashion industry. For college students looking to break into the market, she recommends looking for interdisciplinary fields of study that aren't directly associated with fashion in order to give students a broader perspective of the market. In today's competitive landscape, companies are looking for students who can add value to their role. Ultimately, fashion and technology are intersecting, as in the case of Brittany's current job at Amazon Fashion, and it’s an exciting time to join the conversation. Watch Brittany's full FB LIVE interview with Darcy Camden of Styled Seattle. You can also follow Brittany's fashion adventures on Instagram at @justcallmehicks. Having a desire to work in fashion is broad. There are so many opportunities to work in print, digital, behind/in-front of the camera, in e-commerce, on the sales floor, etc. If you want to work in fashion, there's a role for you if you're willing to work for it! Working and studying supply chain management is the perfect way to prepare you for managing a retail business within a corporation. Be open! You don’t know what you don’t know! GIFT IS FOCUSED ON THE CONVERGENCE OF THE FASHION AND TECHNOLOGY SPACES, AND THE NEED FOR MORE WOMEN TO BE INVOLVED IN THIS SHIFT. Click here to learn more and get involved in Brittany's non-profit GIFT. Superstar fashion blogger Sabrina Tan of Gypsy Tan went from 0 to 147k followers in only 4 years. In fact, her style blog celebrated its 4th birthday just this month. Sabrina generously shared her time and insight with us at the WHAT SHE SAID Style Summit last weekend and offered her best advice on how to succeed as a style blogger. On the 50k Club panel, Sabrina spoke about the importance of carefully curated content and why it's important to put followers first. We love Sabrina because she brings it to you straight, wiping away all the glamour that is often associated with #bloglife because, at the end of the day, it’s #joblife. Check out how she approaches her community in the full Facebook LIVE interview with Darcy Camden of Styled Seattle. You can also follow Sabrina's fashion adventures on Instagram @Gypsytan. If you liked this video, you might also like our interview with Seattle style blogger Aika Yokoyama of Aika's Love Closet. Writer extraordinaire and fashion influencer Chelsea Lankford of the style blog True Lane, recently spoke on the 50k Club panel at the Style Summit about her experience in the blogger sphere— from the extreme challenges of becoming a full-time blogger to the unmatchable rewards of her dedication. Blogging is definitely not the same as when she first began in 2010. The market is now highly saturated but that doesn't stop her from continuing to grow her site. She believes that her creative energy and amazing content allows companies to have a choice when it comes to picking influencers that truly fit their brand. In her Facebook LIVE interview with Darcy Camden of Styled Seattle, Chelsea shares tips on how to get noticed as a blogger and also talks openly about the drawbacks of being a full-time blogger. We invite you to follow Chelsea's fashion adventures on Instagram @truelane and watch the full interview on the Gossip & Glamour Facebook Fan Page now. 1) Connect with local influencers in real life. Seems like a no-brainer, but we live in a digital world and it's so important to get offline and make meaningful connections. 2) Tag brands in your content and send images they can use on social media to their PR team. This is a genius idea to get noticed in the sea of social media. If you have great imagery featuring brands you love, share it! Just be sure to give credit to the applicable photographer and make sure they are ok with you sharing the images with the brand. 3) Use the right hashtags. Instagram lets you use up to 30 hashtags. Use them to be discovered and to connect with likeminded users. If you like this video, you might also like our video with Seattle style blogger Sabrina Tan of Gypsy Tan. There's always more to discuss after the panel ends at the Style Summit, so this year we took the conversation backstage with Darcy Camden of Styled Seattle. She interviewed #WHATSHESAID panelists and took a deeper dive into their stories. Aika Yokoyama of Aika's Love Closet was part of our 50k Club panel and gave us insider tips on how to be successful and actually make money in the blogger space. Aside from creating a standout, personalized brand, she discussed the importance of having a media kit and rate card. This is essential for bloggers who want to work with brands and build relationships. She also discussed the importance of having a mentor to help guide the way. Aika credits fellow blogger and friend Molly Clifton of Style Miss Molly with helping to fuel her growth. Aika now pays it forward by helping fellow bloggers in their personal areas of development. Follow Aika on Instagram @AikasLoveCloset. You can also check out the full interview with Aika on the Gossip & Glamour Facebook Fan page. If you like this video, you might also like our interview with Seattle style blogger Chelsea Lankford of True Lane.